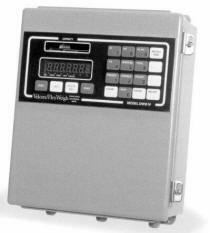 This ultra low profile, electronic, and certified Equine Scale manufactured by Flex Weigh, requires 110-Volt power, and a solid, level surface. It has a proven four load cell design with steel ball and cup suspension, the side rails are live also. Wherever the horse stands on the platform, the scale will read the weight consistently accurate. It weighs approximately 600 pounds and is 4 inches tall at the sides and 1 inch tall in the center and has self contained ramps, horses usually won't notice the scale as they walk onto it. The overall length is 90" and width is 43", four people can pick it up and move it. 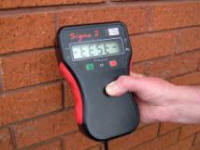 The Scale comes in three pieces: the lower frame, the center platform and the electric wall mounted digital read out. EquiGym is now the proud distributor of these light weight, portable scales manufactured by Palway Limited, a certified scale company that has been solving weighing problems for industry and commerce for more than 20 years. The twin Double Platform design makes it simple for one person to transport and set up the scales so they can be used anywhere, each platform is only 56 lbs, slotted together without need for any tools they combine to make a strong and secure base. 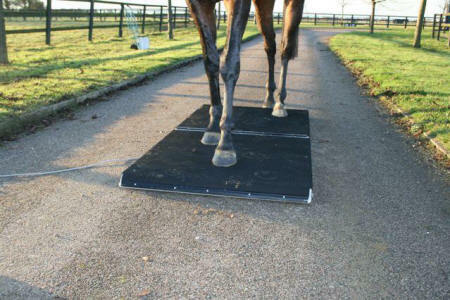 The high quality durable scale is designed to be the lightest weight and lowest profile scale available making it easier for you to set up and use and less stressful for your horses. There is a range of weighing indicators suitable for use with the scales, including battery powered, hand held and display hold models, when the average weight rather than live (fluctuating) weight is shown. 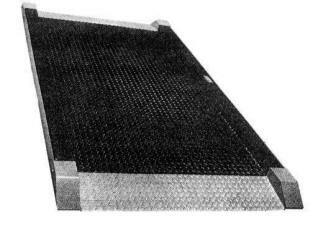 Manufactured from aluminum for lightness and strength the scales are covered with hard wearing non slip rubber matting. The Single Platform weighs in at only 111 lbs with low 2.6 inch profile and sloping leading edge so no need for access ramps meaning it is very easily moved and set up.